The story of Curt Lindner’s life and career as a mathematician is on full display in his office. Stacks of books and papers cover everything from his desk to a small sofa pushed against a wall. No surface is left untouched. The story of Curt Lindner’s life and career as a mathematician is on full display in his office. Stacks of books and papers cover everything from his desk to a small sofa pushed against a wall. No surface is left untouched. Even the walls are adorned with photographs, notes and drawings, each one a memento of his life and career. Lindner is Distinguished University Professor at Auburn University, and the material in his office represents 48-years of service at Auburn. 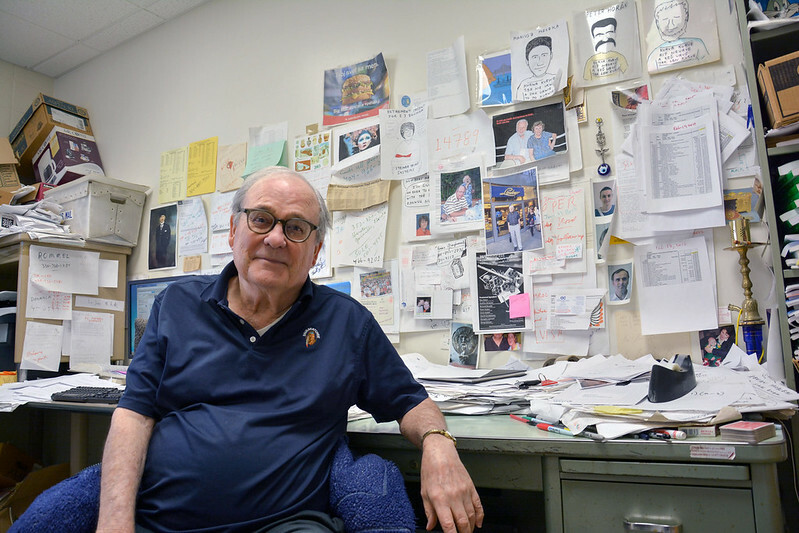 Featured prominently on his office walls is his best friend, fellow mathematician Alexander Rosa, professor emeritus at McMaster University in Canada. Lindner and Rosa met for the first time, face-to-face, in 1970 at a mathematics conference at the University of Montreal. The two immediately hit it off and began a life-long friendship and working relationship. Lindner located a copy of the scholarly work buried within a stack of papers on the sofa in his office. Its pages now yellowed with age, the paper represents the beginning of a career-long collaboration between the two mathematicians who have more than 40 published, co-authored papers. Friends and colleagues Curt Lindner and Alexander Rosa have come full circle. 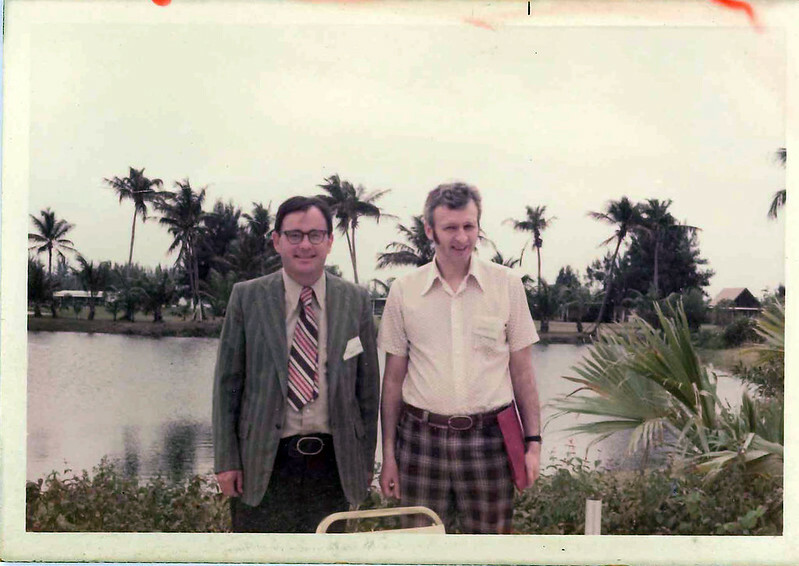 In this photo, they are at the first annual Southeastern International Conference on Combinatorics, Graph Theory and Computing, 48 years ago in Boca Raton, Florida. Lindner and Rosa were both awarded the Euler Medal this year at the 48th conference, which also took place in Boca Raton. Lindner and Rosa were both awarded the Euler Medal at the 48th Southeastern International Conference on Combinatorics, Graph Theory and Computing. The award is the highest honor bestowed by the Institute of Combinatorics and Applications. When asked if he always knew he wanted to be a mathematician, Lindner pointed to a photo hanging on his office door. 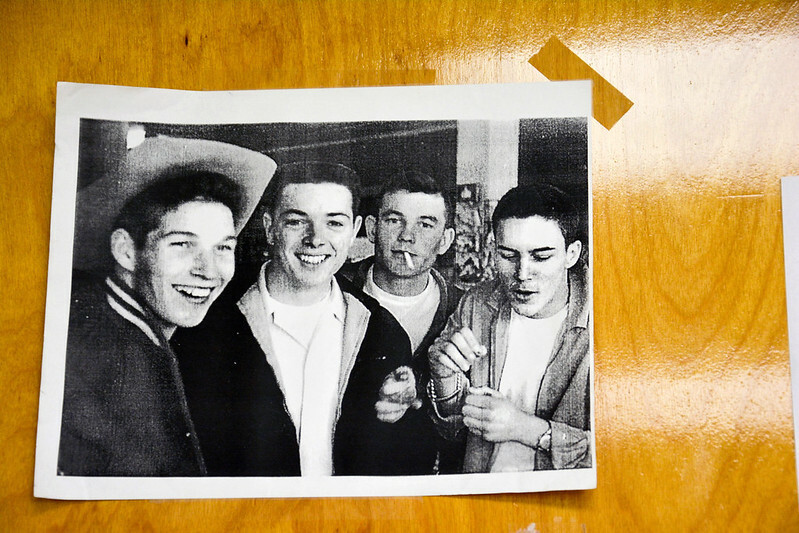 The image shows a 16-year-old Lindner hanging out with three of his friends at a drugstore in Decatur, Georgia, called “Reddings.” They are each donning either letterman or leather jackets and 1950s slick hairstyles. Immediately after high school, Lindner served in the Army before starting school at Presbyterian College, where he had a half scholarship in track and earned a bachelor of science in mathematics. He was accepted at Emory for graduate school, but before beginning work on his master’s, Lindner spent a year in Jacksonville, Florida, teaching at Duncan U. Fletcher High School. After a year as a high school teacher, Lindner continued his education at Emory University, where he received a master’s in mathematics. It’s also where he began dating his wife, Ann. Lindner pointed to a photo of his wife enjoying a day at the beach with their sons. As he looked at the image, he explained how he and his wife went to high school together in Decatur but didn’t start dating until their paths crossed again at Emory. Ann is a registered nurse. She and Lindner have three sons together, and Ann has traveled all over the world with Lindner during his career. 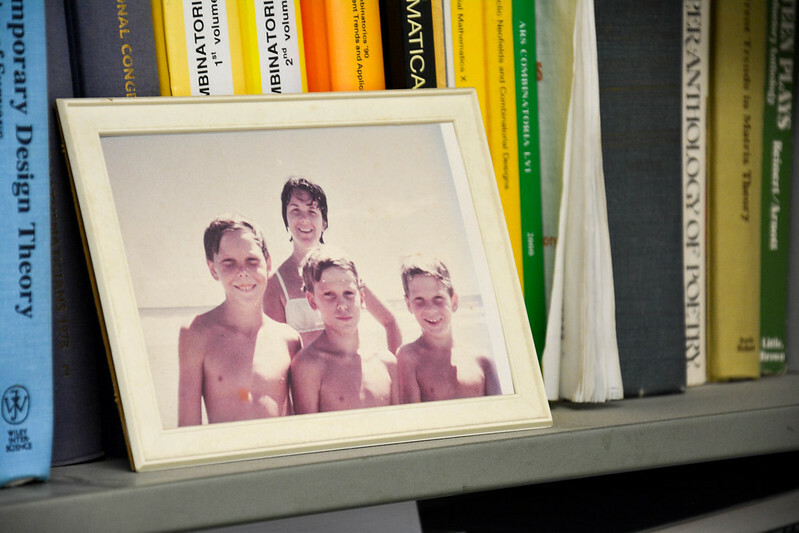 One of the photos on Lindner’s bookshelf features his wife, Ann, and three sons enjoying a day at the beach. Ann has traveled all over the world with Lindner during his career. Their first stop after Emory was Coker College, where Lindner accepted a teaching position. Lindner returned to Emory and pursued a doctorate in mathematics. 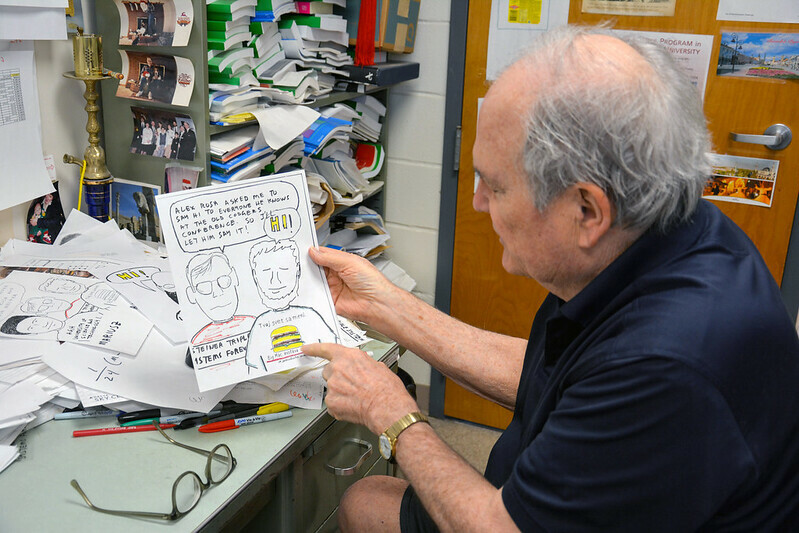 An artist as well as a mathematician, Lindner plays piano and enjoys drawing, especially caricatures of his friends. Lindner looked at a photo of Hall hanging on his office wall and recalled hours spent with him, drinking martinis, discussing discrete mathematics, specifically combinatorics and design theory, a field Lindner described as an abstract form of geometry. Lindner’s office also features photos of mathematicians like Elizabeth Billington, a retired professor from The University of Queensland. Lindner also travels to London once a year, but it’s not a work-related trip. A photo in his office of James Cagney in Yankee Doodle Dandy gives away his passion for the theater and provides a clue as to why he travels to London. “I love mathematics. You get to solve problems. It is all esoteric. There is no money involved. What can I say? I just love mathematics." Although Lindner harbors a desire to be an actor, he readily acknowledges he made the right choice to pursue a career in mathematics. He appreciates that his work has taken him all over the world, including Italy, Kuwait, Iran, Slovak Republic, Czech Republic, Turkey, Australia, Poland, Thailand, England, New Zealand and more; and that he has developed lifelong friendships with colleagues both at Auburn and abroad. Mathematics Professor Curt Lindner received the highest honor bestowed by the Institute of Combinatorics and Applications, the Euler Medal. 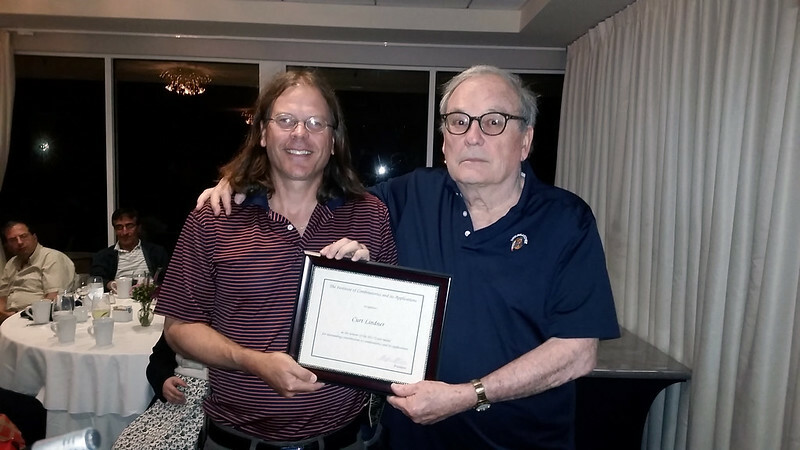 In this photo, Lindner is holding the medal certificate with his son, Curt, at the 48th Southeastern International Conference on Combinatorics, Graph Theory and Computing in Boca Raton, Florida.